This week's game in the GAME FEAST Lineup is Comic Jumper, Twisted Pixel's latest digital game. I loved both the Maw and Splosion for their humor and gameplay, and Comic Jumper looks to be no different in that department. If this is anything like the Sega classic Comix Zone, I'm in! "Here we are, it’s impulse buy time. You already know how awesome "Comic Jumper" is going to be from that sweet demo, but maybe you need more. How about a free premium dashboard theme? Free gamerpics? Free avatar accessories? Yes. Tons of unlockables and bonuses? How about a few new "Splosion Man" levels for good measure? 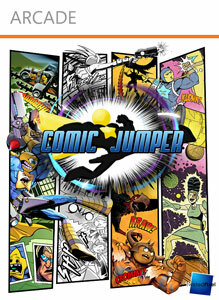 "Comic Jumper" comes from Twisted Pixel Games, creators of the award-winning "Splosion Man" and "The Maw"."